Oh, that stew that stands before you was such a glorious dish. And it was easy, once all the vegetables were chopped up and the chicken thighs (which are buried underneath) were dredged and browned. But I think that’s not why I loved this meal so much. I made this way back in August the night my husband was to return home from his 2 week bicycle adventure up in the East Kooteney’s (that’s in beautiful British Columbia for those not in the know). I missed him terribly and I wanted him to come home to a really good homemade meal. I had a ton of vegetables from our abundant CSA, some thyme from our garden, along with some chicken thighs and farmer’s sausage. A stew brimming with local flavour seemed perfect and homey. It’s the kind of meal made from the heart. No exact measurements required. Just go with your guts and you’ll be fine. Chunks of summer squash, baby eggplant, onion, mushrooms, purple potatoes, red-skinned potatoes, carrots and tomatoes mingled with a good glug of riesling for a perfect summer supper. It’s simplicity and it was the perfect welcome home meal made with lots of love. Honestly I don’t know why I didn’t post this recipe until now, but I’m glad I’m mentioning it now. While I took a summer approach to this meal back in August, I think it would do nicely for the fall and winter. 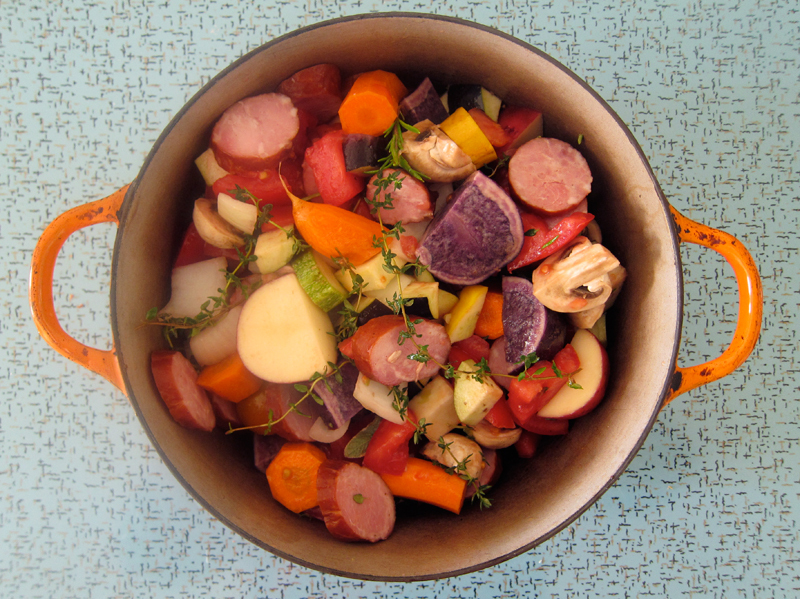 Root vegetables and red wine would create a hearty and winter warming dish. And if you’ll be in Vancouver, please stop by the new Vancouver Convention Centre from Thursday to Sunday this week for the One of a Kind Show & Sale. I’ll be there with my Hob Snobs pals selling up a storm (or so we hope!). I’d love for you to stop by! Preheat oven to 400F. Add flour and spices along with pepper and a sprinkle of salt and toss with a fork on a large plate. Dredge the chicken pieces in the flour, shaking off any excess and set aside. Heat olive oil over med-high heat in a large heavy stock pot. When oil is hot, add chicken and brown on both sides, 5 minutes per side. Remove chicken. Pour a tablespoon of olive oil if needed and add in garlic and onion and saute until soft, fragrant and just starting to caramelize. Put the chicken back into the pot and top off with the vegetables, sausage and pour in the wine. Season with a touch of salt and a good grind of pepper, chilis and add in thyme. Place the lid on your pot and pop into the oven for 45 minutes to 1 hour. Halfway through the cooking, check to see if more liquid is needed – if so, add a bit more wine or stock or water and give things a bit of a stir. Remove the lid for the last remaining 15 minutes to help evaporate and thicken up the liquid. Serve in deep bowls with crusty bread. OK, you know I don’t eat chicken, but the color here! WOW! I just had to comment. And love the blue toenails! The wonders of back-up photos! Life does sound crazy for you right now, but in a good way! This stew looks delicious. Dana’s right – all that color is amazing. You don’t often get that in stews. Those colours are great, just the kind of thing that would be perfect for cold, grey winter days like these. Good luck with all the shows! 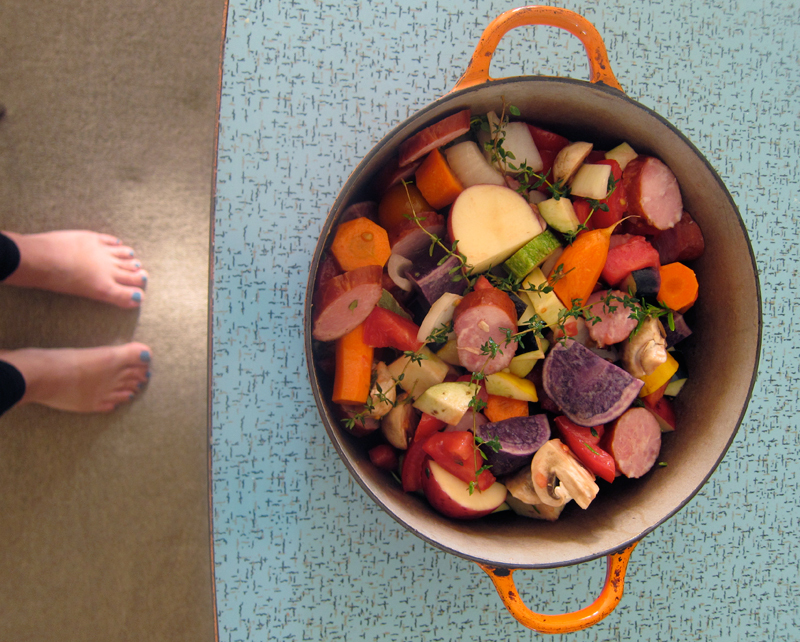 This looks fantastic and inspires me to make a big stew too — but I also love that your toenail polish matches your countertop in the top photo. Coincidence probably, but well done! Yum! 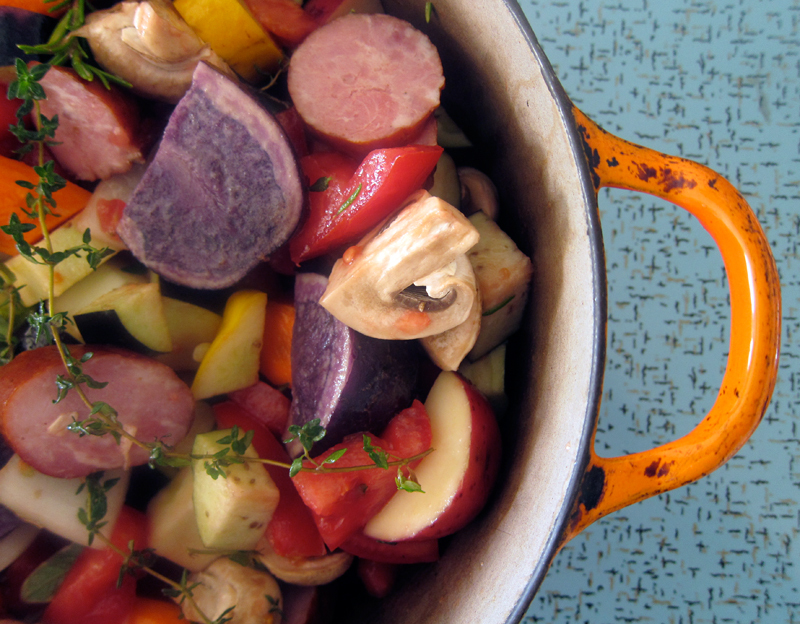 Stews are such a great comfort food. I love that there are chilis in this — nothing warms the belly faster than some spice! Thanks for all of the links and inspiration! This looks beautiful and I love that your toe nails seem to match the counter top. The stew certainly looks and sounds delicious, but also adding that I love the toenails! And wouldn’t you know–we have chicken thighs languishing in the freezer. It’s officially freeeeezzzing in NYC, so this will be just the thing. Hope your having fun crafting! Sure sounds like it 🙂 Love this recipe looks delish and is making me rather hungry! Take care of yourself!! Sounds like a perfect meal for this time of year. The colours of the stew and the orange pot together are so captivating…and the blue toes are the cherry on top 🙂 Good luck with all the craft shows! p.s. I made your chicken in riesling dish for my in-laws and it turned out so delicious! I know, Joanne, great to have something handy when it gets all to crazy. Meredith, def a coincidence, but a happy one, obvs. Alicia, I’m all for a good bite of spice! Rivki, no the colours do fade after cooking but it’s still a good hearty looking dish once it’s ready. Just not as vibrant. Thanks Nicole, it’s definitely the before photo which lends it to the vibrancy. Natasha, I wish you could too! Elizabeth, thanks – perfect for a cold day. Thanks Bijoux! Glad that chicken dish worked out for you. This one isn’t as fancy tasting, but it’s warming and delicous. Wow, that looks like a rainbow in a pot. Beautiful! And the toenails are really pretty, too. Gorgeous – loving that stew, want a bowl right now!!! Geez you’re still not back to write a new post kickpleat. Anyway, my eyes are so filled with the lovely colors of this stew can’t wait to end the day and pick up the ingredients. I really do love a good one pot wonder. This dish looks really pretty and I love your orange cooker. I have a beetroot red cooker that I adore. I wish my thyme plant flourished enough for me to use. I will try to be a better gardener in the new year! Jeannette, I hope you’re making it through this time with grace (and with your sanity intact)! Cold cereal is completely legitimate…I’ve done that myself many an evening, too. 🙂 But this soup is certainly something to strive for when the craziness is all over! Good luck with your own circus – I can’t wait to hear more!! Thanks Lynn, it really was a rainbow in a pot. Cookiepie, I’ve got a bowl coming right up. SixBalloons, I know, I was so lucky to find it. I really must start thrifting again, it’s been ages. Thanks! Genie, for some reason, my thyme plant did really well. Good luck with the gardening! Maddie, thanks so much for your kind words. Sanity now.